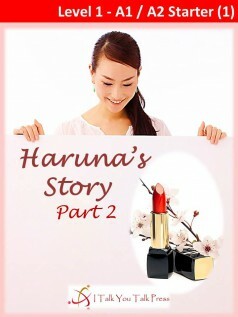 This is part 2 of Haruna’s Story. The story starts in part 1. Haruna starts a new life in Los Angeles. She is the manager of her company’s cosmetics store. She works hard every day, but her boss is never happy with her work. She feels very stressed and tired. Her rival, Kana, is the manager of a store in New York. The New York store sells more cosmetics than Haruna’s store. Haruna thinks, “I must try harder!” Then, one day, she meets someone special and her luck changes.